← Fertility forecast for free? The good people at the Institute for Women’s Policy Research have a new brief report on the gender gap in pay, based on 2011 data from the Bureau of Labor Statistics. A few occupations were on both lists, and some had two few women or men to calculate relative wages, so only 30 are shown here. This report follows a recent appearance by IWPR’s president, Heidi Hartmann, on the Rachel Maddow show. Hartmann has posted this review of their discussion about the gender pay gap. 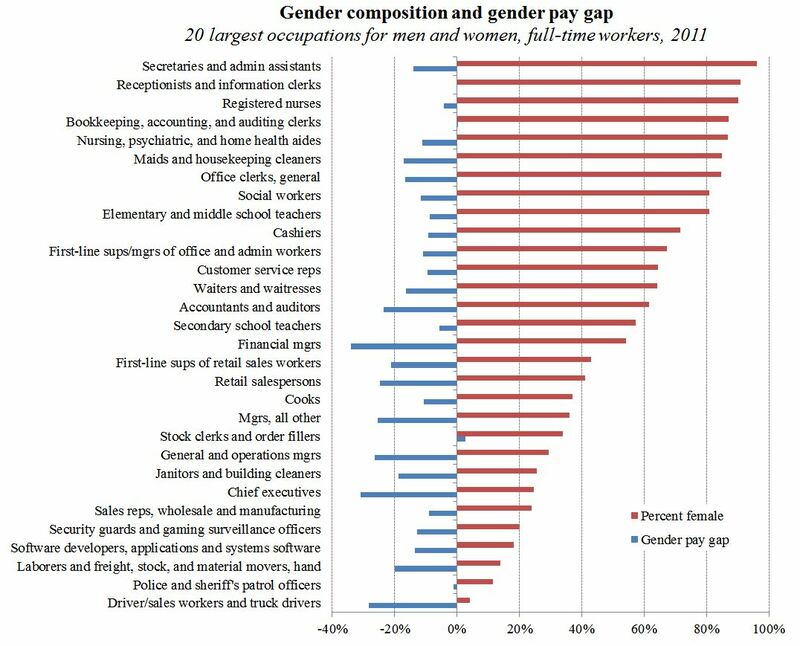 * This is the opposite of the pattern Matt Huffman and I found in our 2003 paper, where the gender gap was greater in female-dominated jobs (with statistical controls and 1990 data). Something to look into. Looks like responsibility for money has something to do with the blue bars. Why not add a scatterplot? It would lose the job titles but would more clearly show the relation between variables. How much of the wage gap caused by management being Men and thus naturally Evil Bastards (even though the person managing those secretaries is probably a woman) and how much by women being passive? Familial anecdotes say that women who negotiate firmly get paid more than women who just take what’s offered. How much of pay differentials are caused by seniority? Do we know how the factors are broken out?